For a while, we haven’t really loved Nutella, shocking though that is. Neither of us really like hazelnuts that much, so we usually don’t bother eating it. That is, until we saw these cookies. We figured that there was nothing to lose as far as making them, so why not try them out? Well, good thing we did because they were amazing (and, getting to dip pretzels in extra Nutella was another bonus. Guess we do like Nutella after all!). 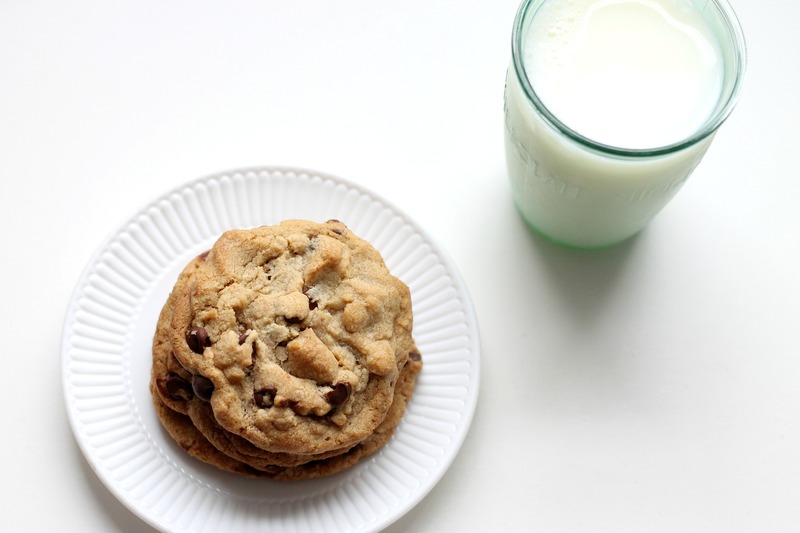 Basically, you start out by browning butter, and then making a base similar to these cookies. Then comes the fun part: fill a piping bag with Nutella, and pipe little dollops on a parchment paper- lined baking sheet. Then you freeze them for an hour so you have little Nutella discs to stuff the cookie dough balls with. We did probably a little over a teaspoon per cookie, but we think that it definitely would not hurt to add a little more. Regardless though, everyone from some friends to our brothers and grandparents loved them. Including our brother who would never touch anything including hazelnuts with a 10-foot pole! What are you waiting for? Go make them! Line a baking sheet with wax or parchment paper. Place Nutella in a piping bag (or, if you don’t have one, a ziploc bag- we just found a piping bag easier). Snip one corner off the end of the bag and pipe small dollops of the spread onto the parchment paper paper, about 1½ teaspoons each (do more or less, if you like). Make about 24 dollops. Transfer the baking sheet to the freezer and let sit until firm, at least 45 minutes. Place the butter in a skillet over medium heat. Melt the butter. Continue to cook until the butter foams, bubbles slightly, and begins to brown, whisking often. Continue whisking until the butter is evenly browned. Be careful not to burn it! Remove from the heat and let cool. Line baking sheets with silicone baking mats or parchment paper. In a medium bowl, whisk together the flour, baking soda and salt. In the bowl of an electric mixer, combine the sugars and the brown butter. Mix on medium speed until smooth. Blend in the egg and egg yolk, and scrape down the bowl. Blend in the vanilla and yogurt, sour cream, or cream cheese. With the mixer on low speed, blend in the dry ingredients just until incorporated. Fold in the chocolate chips. Chill the dough briefly, about 30 minutes. Preheat the oven to 350˚ F. Scoop a two-tablespoon portion of cookie dough. Press an indentation into the center of the dough ball to create a bowl shape. Place a dollop of the frozen Nutella in the indentation and pinch together the edges of the cookie dough over the top to completely seal it in the center. Keep the other Nutella dollops in the freezer while you are working on one sheet. Place the shaped cookies on the prepared baking sheets, 2-3 inches apart. Bake until the cookies are golden brown and set, rotating the pans halfway through, about 14 minutes total. Let sit a few minutes, then transfer to a wire rack to cool. Repeat with the remaining dough as needed. Enjoy! 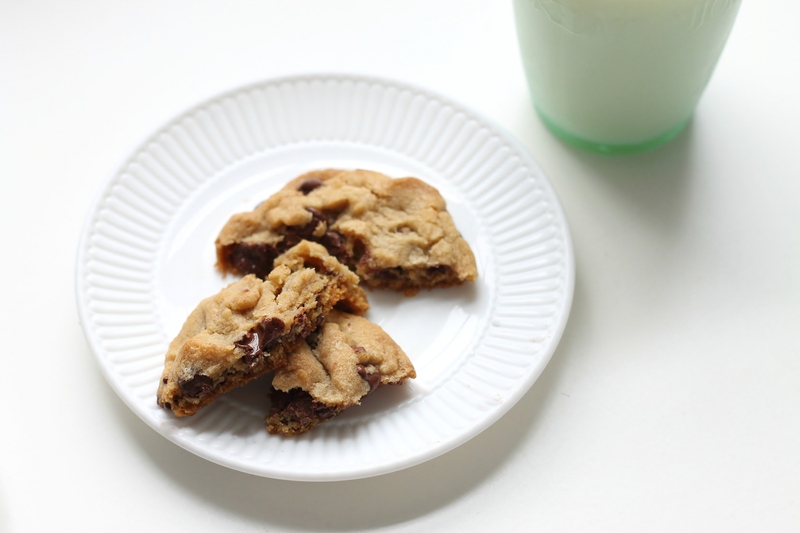 Note: the original recipe calls for sprinkling your finished cookies with more coarse sea salt, but as we aren’t huge fans of overly salty desserts, we omitted that step. We loved the cookies as-is. However, if you like the combination of chocolate and salt, feel free to give each cookie a light sprinkling of salt. Either way, they will be delicious! Same, we both have cookie addictions (probably not a good thing). This recipe is a particularly awesome one!